As it is the best suited of the dairy goat breeds to hot conditions, the Anglo Nubian has been used in grading-up programs in many tropical countries to increase the milk and meat production of local breeds. 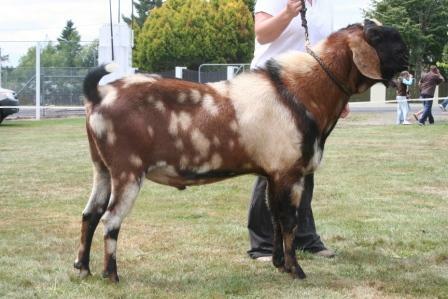 The Anglo-Nubian is a relatively large, proud, and graceful dairy goat. The Anglo-Nubian goat is named for Nubia, in northeastern Africa. The originally goats imported from Africa, Arabia and India were long-legged, hardy goats that had some characteristics desired by goat breeders in England. English breeders crossed these imported bucks on the common short-haired does of England prior to 1895 to develop the Anglo-Nubian goat. In the United States the breed is usually spoken of as the Nubian. The Anglo-Nubian is regarded as an “aristocratic” appearing goat and has very long, pendulous ears that hang close to the head. The Anglo-Nubian carries a decidedly Roman nose and is always short-haired. Any solid or parti-colored coat is permitted in the Anglo-Nubian, but black, red or tan are the most common colors, any of which may be carried on combination with white. Usually there is shorter hair on the Anglo-Nubian males, particularly along the back and on the thigh, than is commonly found on the Swiss breeds. The udder of the Anglo-Nubian is capacious but is sometimes more pendulous than that of the Swiss breeds. A mature doe should stand at least 30 inches at the withers and weigh 135 pounds or over, while the males should stand at least 35 inches at the withers and weigh at least 175 pounds. The Anglo-Nubian usually gives less milk than the Swiss breeds, but produces a milk of higher butterfat content. The head is the distinctive breed characteristic, with the facial profile between the eyes and the muzzle being strongly convex. The ears are long (extending at least one inch beyond the muzzle when held flat along the face), wide and pendulous. They lie close to the head at the temple and flare slightly out and well forward at the rounded tip, forming a “bell” shape. The ears are not thick, with the cartilage well defined. The hair is short, fine and glossy. Any color or colors, solid or patterned, is acceptable.